For bloggers and freelance writers like me, email marketing is very important. It's an essential tool in getting one's self out there, in positioning you and your blog in the competitive arena that is the world wide web. To establish a name for yourself, one not only needs to be adept in writing but also in socializing with fellow bloggers and writers, and marketing one's self to potential sponsors and business partners. This is where the role of Mad Mimi HTML Email comes into the picture. 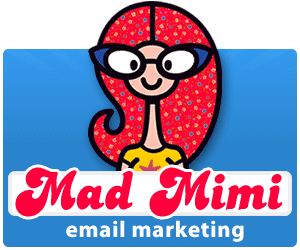 Intelligent, powerful, and easy to use, Mad Mimi makes email marketing a simple task for the creator, and pleasing to the eyes for the reader. It's the easiest way to create sophisticated and well-designed newsletters and promotional blurbs. From dab to fab - that's how Mad Mimi transforms your plain email message into a commanding correspondence, with a themed design and layout to boot. A concise and well-written email that also looks pretty is bound to attract attention, which can translate into sponsored posts and ad placements in one's blog. or website. If you're lucky, you might have the chance to be hailed as Brand Ambassador and get to appear for a print ad just like me! Aesthetics aside, Mad Mimi makes your mailing list easier to organize and manage. Sorting out duplicate emails, bouncing messages, and unsubscribes are now the least of your worries as these are done automatically. All these made possible by Mad Mimi's real-time tracking, an application that can detect who clicked which links and shared this promotion with their friends. Speaking of sharing, Mad Mimi can also be integrated into social media sites such as Facebook, Twitter, Pinterest, and even Google Analytics. Aside from that, you also have the option to extend Mad Mimi with auto-responders. No need to worry about correspondences while you're on vacation or taking time off from the online world. For those who would love the give Mad Mimi a try, they're currently offering a Free Plan complete with all the features. Paid plans are also available, with prices beginning at $8 per month. Disclaimer: This is a sponsored post in behalf of Mad Mimi. Thoughts and opinions expressed are entirely mo own. Great post! I agree with Pretty/Ugly. I will be saving this information for if/when I decide to start really monetizing and marketing my blog. It sounds VERY reasonable!! And your timing couldn't be more perfect with all the worry over Google email being deleted. Great tip! I hadn't heard of this particular service. Thanks for sharing. Mad Mimi Email would definitely make those email presentation more interesting and enticing.